Is investing in the stock market something that is complex, mysterious and risky and therefore best left to the professional? “Warren Buffett has shown this to be a myth,” says James Pardoe in his book “How Buffett Does It”. James Pardoe says in the book, which shares 24 simple investment strategies from the world’s greatest value investor, that anyone with average intelligence is more than capable of being a successful value investor because the fundamentals of sound investing are easy to understand. 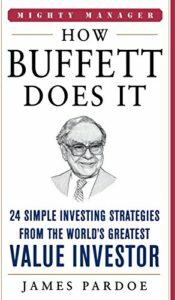 “An important lesson that Buffett learned from his mentor, Ben Graham, was that you don’t have to do ‘extraordinary things to get extraordinary results’,” says James Pardoe. The author says this is the core principle of Buffett’s philosophy of investing.